2016 BMW 3-Series Pros and Cons: Why (Not) This Car? After making the 3 Series into the sport sedan everyone else aimed for, BMW decided to pursue a broader market with a 2012 (model year) redesign. I didn't care for the result, finding the new 3 too large, squishy, and even numb for my taste. I was far from alone in this. In response, BMW has thoroughly tweaked the 3 Series for 2016. Have the tweaks made enough of a difference? Not terribly long ago none of the 3's competitors came close to providing the same level of driving satisfaction. But decades of trying to meet and even beat the benchmark have paid off. Today's 3 Series must compete with many excellent cars, including the Audi A4 (which I'll be reviewing next), Cadillac ATS, Infiniti Q50, Lexus IS, and Mercedes-Benz C-Class. The upcoming Alfa Romeo Giulia also promises to be great fun to drive. For this review, though, I'll mostly compare the updated 3 with the latest addition to the class, the all-new Jaguar XE. Good materials, but could be more cleanly or more dramatically styled. Why the 2016 BMW 3-Series? The latest BMW 3 Series excels in nearly every way. But for each of its many strengths at least one competitor is about as good or better. So, why buy the BMW? Partly because while a competitor might be better in one or two areas, it'll be worse, even much worse, in others. If you are willing to make substantial tradeoffs to maximize driving enjoyment or long-term reliability, the BMW isn't going to be your pick. If you want the best all-around premium compact sedan, though, the BMW is arguably the one to get. (If you want a conventional wagon, it's nearly the only one North Americans can get.) The new Audi A4 feels roomier, especially in the back seat, while the Mercedes-Benz C-Class has a nicer interior. But which of these three is the best all-around will come down to personal tastes and priorities. What if you're among the few car buyers who insist on a manual transmission? The tested 340i had one. Among direct competitors, only the Cadillac can be purchased with a clutch in North America (and then only with the 2.0T and 3.6T engines, not with the non-turbo 3.6 that competes most directly with the tested 340i). The Cadillac can be even more fun to drive than the BMW, but it has a much tighter rear seat, a much smaller trunk, inferior fuel economy, and a few other shortcomings. If you want a manual transmission but can't abide the ATS's shortcomings, the 3 it is. 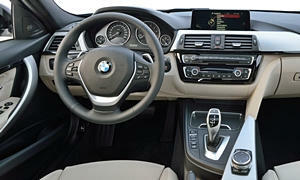 Beyond a manual transmission, if you can get a feature on a competing car then you can probably get it on the 3 Series. 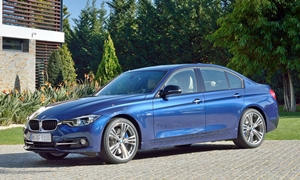 A number of BMW 3 Series variants offer better fuel economy than the tested 340i xDrive. You can get a conventional four-cylinder (with EPA ratings of 23 city, 35 highway), a diesel (32/42), or even a plug-in hybrid (28/34). But for a 320-horsepower all-wheel-drive sedan, the 340i xDrive rates quite well: 21/31 with an automatic, 19/29 with a manual. Some six-cylinder competitors score nearly as well, but none quite match the BMW. For example, the tested Jaguar XE with all-wheel-drive and its mandatory automatic rates 20/29. The BMW's trip computer reported even more impressive real-world averages. In light-footed suburban driving it reported 32 mpg, and on a 70-mph highway it reported 37 mpg in one direction and 34 mpg in the other. Classic BMW rear side window kink. Good ergonomics; iDrive is much more user-friendly than in early iterations. But smallish display? If you want a premium compact sedan with classic rear-wheel-drive proportions and clean, tasteful styling, the BMW 3 Series will do. The stylistic excesses of the 2006-2011 sedan were eliminated with the 2012 redesign. But if you feel you've seen this car many times before, it's because you have. There's nothing new or even distinctive here. It looks like a BMW. This is a good thing for many people, but might not be enough for others. The Jaguar XE looks enough like the 3 Series from the side that people who don't know cars might mistake it for the BMW. The same goes for the new Alfa Romeo Giulia. With the BMW, you're at least getting the original. With at least 320 horsepower (BMW tends to under-rate its engines) to motivate its 3,800 pounds, the 340i is very quick. Even with a manual transmission--a disadvantage these days if you care only about the quickest time--the 340i xDrive can rocket from a dead stop to 60 mph in under five seconds. Those who feel the need for a little more thrust than the regular 340i offers can now purchase a 35-horsepower bump for $3,195. This "M Performance and Sound" option also includes a freer flowing and likely more throaty exhaust. Even without this option BMW's new six-cylinder engine sounds sweeter than the old one, with the singing of sophisticated machinery at high rpm and an occasional snap and crackle from the exhaust (now lower in tone). Your ears will enjoy exercising it. The Jaguar's engine makes more noise, but of a less pleasant quality. The manual shifter is typical BMW: smooth and reasonably precise, but with a less mechanical feel than I personally prefer. Why Not the 2016 BMW 3-Series? Given that the BMW 3 Series has led the class for decades, it should come as no surprise that its price ranks among the highest in the class. That said, I am somewhat surprised that the 340i's base price jumped by over $2,000 from the tested 2016 to the 2017 you'll now find at dealers, landing at $48,895. The tested car, with most but not quite all options, would sticker for $62,820 as a 2017. A similarly equipped Jaguar XE lists for about $2,500 less. BMW often heavily subsidizes 3 Series leases, such that you might be able to lease one for much less than its window sticker suggests. When I visited the Jaguar dealer they admitted that their lease rates for the XE were not competitive, at least not yet. This noted, the same can be said about every competitor save the Lexus IS and perhaps the Infiniti Q50 (which doesn't yet have much of a track record, and which initially suffered from software issues). We don't have data on the XE, but Jaguars aren't renowned for their reliability. With this, I'm out of "why nots." A champion in the premium compact sedan all-around, the BMW 3 Series lacks glaring weaknesses. The rear seat is a little roomier than the XE's, but I'd prefer a cushion higher off the floor. The oh-so-BMW interior of the 3 Series looks and feels more upscale than that in the Jaguar, but isn't as cleanly styled as that in the Audi A4 / S4 or as stunning as that in the Mercedes-Benz C-Class. Well ahead of the class norm when redesigned for the 2012 model year, the rear seat of the BMW 3 Series remains much roomier than that in the Cadillac ATS and a little roomier than those in the Jaguar and Mercedes. But it cannot match that in the 2017 Audi A4 for roominess and comfort. For a good view over the BMW's somewhat tall (but not deep) instrument panel I have to raise the seat a little. I prefer the nearly ideal (for me at least) driving position in the Jaguar, which has a lower instrument panel and which doesn't seem as large or as bulky from the driver seat. And the driver seat itself? BMW's sport seats can be adjusted to provide excellent lateral support, but don't feel especially luxurious. The Jaguar's seats lack adjustable bolsters and feel no more luxurious. Engine and road noise are both lower in the BMW than in the Jaguar. Even with the M Sport suspension, the tested 340i's ultra-grippy Michelin Pilot Super Sport tires clomped much less over road surface imperfections than the Jaguar's and especially than the Mercedes-AMG C43's (tested when it was the C400). I've saved the traditional forte of the BMW 3 Series, and the area I was most curious about, for last. The tweaks for 2016 did improve the steering's precision and directness (especially in sport mode) and the suspension's control of body motions. With the optional M Sport suspension and adaptive dampers there's now just a hint of bobbling about in comfort mode, and not even a hint in the others. I preferred the sport and sport+ modes even on Michigan's chunked-up roads, as these modes tightened up the car's handling while arguably also improving its ride quality. An impressive level of refinement that the Jaguar cannot match. When taking curves quickly the BMW 340i grabs and holds a tight line. Even with all-wheel-drive I rarely detected any understeer worth mentioning when driving at quasi-legal speeds on public roads. (The fitted Michelin Pilot Super Sport tires have high limits.) The 340i xDrive simply goes where you point it. The all-wheel-drive system's default 40/60 torque split enables some desirable tail-out behavior from the rear end if you get on the gas in a curve, but this system and electronic stability control limit oversteer to safe levels. While the BMW 340i's handling might approach technical perfection (for a car of its family transporting dimensions, at least), all is not ideal. I could sense what was going on at each wheel when driving the car hard through curves, yet I still didn't feel all that engaged. It doesn't help that the 3 Series feels about the same size and weight as a 5 Series from the pre-Bangle era. Back then I preferred driving the E36 3 Series to driving the E39 5 Series because the former was lighter and more compact. My preferences haven't changed. The Jaguar XE isn't as refined as the BMW 3 Series. It rides more firmly and noisily. Some people will find its steering overly light. But, compared to the BMW, it feels lighter, more agile, and simply more engaging. It's the car I'd rather drive. BMW improved the performance, steering, and handling of the 3 Series for 2016, but wasn't able to reduce the perceived size and weight of the car. Some competitors (including the new Jaguar XE) remain more agile and more fun to drive. But these competitors lag the 3 Series in other areas, such as rear seat room, ride quality, noise levels, and overall refinement. Anyone seeking an excellent all-around premium compact sedan, with many strengths and few weaknesses, must put the BMW at or near the top of their list. But which 3 Series? This depends on how quick you want the car to be. Even the 180-horsepower 320i (or the similarly powerful but torquier 328d diesel) is plenty quick for most drivers most of the time. Need really quick? Then the 248-horsepower 330i should do the trick, but you won't mistake the sounds it makes for those of BMW's legendarily smooth inline six-cylinder engine. For a more thrilling soundtrack and ultra-quick acceleration, get the tested 320-horsepower 340i. And for overkill there's the 425-horsepower M3. Want a wagon? Then your choices are limited to the 330i and 328d. But at least BMW offers a wagon. Or maybe a hatchback with less cargo space but more passenger room? I found the 3 Series Grand Turismo more appealing than the regular 3 (aside from the lack of a manual transmission option and mandatory all-wheel drive). For less practicality but more style BMW also offers the related 4 Series in two-door coupe, four-door hatchback-coupe (we're all confused), and hardtop convertible forms. No one offers more choices in this class. And while the prices might be high, the lease payments might not be. BMW has long been known for its smooth, powerful inline sixes. The new one even excels at mpg. Largest trunk the the class. But no spare tire beneath its floor. BMW provided an insured car for a week with a tank of gas. Jaguar of Troy (MI) helpfully provided an XE for a comparison test drive. They can be reached at (877) 436-8234. 2016 BMW 3-Series pros and cons, according to Michael Karesh: the best reasons for buying (or not buying) the 2016 BMW 3-Series. Join TrueDelta to post your own impressions. According to BMW's brochure the 3 series sedan has a 13-cubic foot trunk. I see that now as well, and should have checked more thoroughly since BMW often has two sets of stats for its cars. I suspect one is based on European standards, and the other is based on American (SAE) standards, and they don't always keep the two straight. For what it's worth, the trunk in the XE doesn't appear as large as that in the BMW, so it was likely measured using the same standards that resulted in the 17 cubic foot stat for the latter. I'm going to revise the stat in our database to 13 cubic feet, and likely delete that section from the review. We all need copy editing help. I have more than 30 years writing experience and learned the value of having someone (or more than one) go over my words very early. I hadn't seen that mistake at C&D. You'd they would know better, but then we're all only human. The thing is, it isn't a copy editing mistake. This is a stat BMW has provided at various times in the past. I was previously aware of issues with their passenger compartment stats--they've often had two different sets of numbers in recent years. Two different trunk volume stats is news to me. In general, the specs and features information coming out of the OEMs has been getting worse and worse, to the extent that maintaining our specs and features database often makes me want to tear what remains of my hair out. That back seat feels like a wooden park bench. My brother was looking to buy so I went along as back seat rider while the salesman did salesman things in the front passenger seat, and didn't feel tempted to get behind the wheel at all when offered. Twenty-five minutes back there felt like an eternity and my bum went to sleep. Apparently BMW has not discovered foam rubber thicker than half-an-inch. Was only the four cylinder model but I doubt the back seat changes.